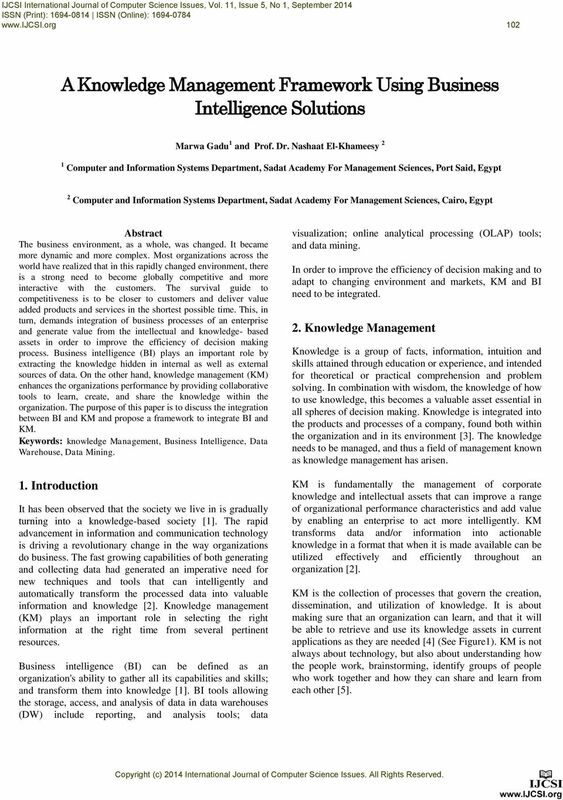 Download "A Knowledge Management Framework Using Business Intelligence Solutions"
1 102 A Knowledge Management Framework Using Business Intelligence Solutions Marwa Gadu 1 and Prof. Dr. Nashaat El-Khameesy 2 1 Computer and Information Systems Department, Sadat Academy For Management Sciences, Port Said, Egypt 2 Computer and Information Systems Department, Sadat Academy For Management Sciences, Cairo, Egypt Abstract The business environment, as a whole, was changed. It became more dynamic and more complex. Most organizations across the world have realized that in this rapidly changed environment, there is a strong need to become globally competitive and more interactive with the customers. The survival guide to competitiveness is to be closer to customers and deliver value added products and services in the shortest possible time. This, in turn, demands integration of business processes of an enterprise and generate value from the intellectual and knowledge- based assets in order to improve the efficiency of decision making process. Business intelligence (BI) plays an important role by extracting the knowledge hidden in internal as well as external sources of data. On the other hand, knowledge management (KM) enhances the organizations performance by providing collaborative tools to learn, create, and share the knowledge within the organization. 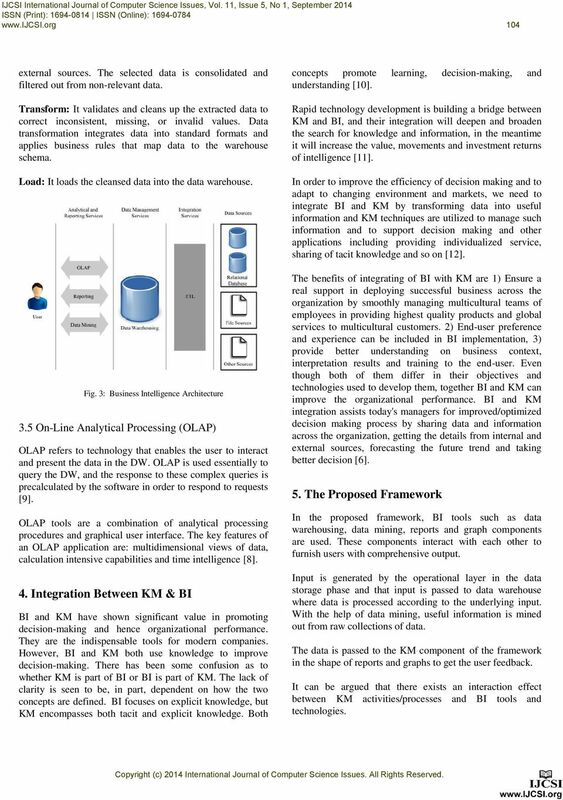 The purpose of this paper is to discuss the integration between BI and KM and propose a framework to integrate BI and KM. Keywords: knowledge Management, Business Intelligence, Data Warehouse, Data Mining. 1. Introduction It has been observed that the society we live in is gradually turning into a knowledge-based society . The rapid advancement in information and communication technology is driving a revolutionary change in the way organizations do business. The fast growing capabilities of both generating and collecting data had generated an imperative need for new techniques and tools that can intelligently and automatically transform the processed data into valuable information and knowledge . Knowledge management (KM) plays an important role in selecting the right information at the right time from several pertinent resources. Business intelligence (BI) can be defined as an organization's ability to gather all its capabilities and skills; and transform them into knowledge . BI tools allowing the storage, access, and analysis of data in data warehouses (DW) include reporting, and analysis tools; data visualization; online analytical processing (OLAP) tools; and data mining. In order to improve the efficiency of decision making and to adapt to changing environment and markets, KM and BI need to be integrated. 2. Knowledge Management Knowledge is a group of facts, information, intuition and skills attained through education or experience, and intended for theoretical or practical comprehension and problem solving. In combination with wisdom, the knowledge of how to use knowledge, this becomes a valuable asset essential in all spheres of decision making. Knowledge is integrated into the products and processes of a company, found both within the organization and in its environment . The knowledge needs to be managed, and thus a field of management known as knowledge management has arisen. KM is fundamentally the management of corporate knowledge and intellectual assets that can improve a range of organizational performance characteristics and add value by enabling an enterprise to act more intelligently. KM transforms data and/or information into actionable knowledge in a format that when it is made available can be utilized effectively and efficiently throughout an organization . KM is the collection of processes that govern the creation, dissemination, and utilization of knowledge. It is about making sure that an organization can learn, and that it will be able to retrieve and use its knowledge assets in current applications as they are needed  (See Figure1). KM is not always about technology, but also about understanding how the people work, brainstorming, identify groups of people who work together and how they can share and learn from each other . 3 104 external sources. The selected data is consolidated and filtered out from non-relevant data. Transform: It validates and cleans up the extracted data to correct inconsistent, missing, or invalid values. Data transformation integrates data into standard formats and applies business rules that map data to the warehouse schema. Load: It loads the cleansed data into the data warehouse. Fig. 3: Business Intelligence Architecture 3.5 On-Line Analytical Processing (OLAP) OLAP refers to technology that enables the user to interact and present the data in the DW. OLAP is used essentially to query the DW, and the response to these complex queries is precalculated by the software in order to respond to requests . OLAP tools are a combination of analytical processing procedures and graphical user interface. The key features of an OLAP application are: multidimensional views of data, calculation intensive capabilities and time intelligence . 4. Integration Between KM & BI BI and KM have shown significant value in promoting decision-making and hence organizational performance. They are the indispensable tools for modern companies. However, BI and KM both use knowledge to improve decision-making. There has been some confusion as to whether KM is part of BI or BI is part of KM. The lack of clarity is seen to be, in part, dependent on how the two concepts are defined. BI focuses on explicit knowledge, but KM encompasses both tacit and explicit knowledge. Both concepts promote learning, decision-making, and understanding . Rapid technology development is building a bridge between KM and BI, and their integration will deepen and broaden the search for knowledge and information, in the meantime it will increase the value, movements and investment returns of intelligence . In order to improve the efficiency of decision making and to adapt to changing environment and markets, we need to integrate BI and KM by transforming data into useful information and KM techniques are utilized to manage such information and to support decision making and other applications including providing individualized service, sharing of tacit knowledge and so on . The benefits of integrating of BI with KM are 1) Ensure a real support in deploying successful business across the organization by smoothly managing multicultural teams of employees in providing highest quality products and global services to multicultural customers. 2) End-user preference and experience can be included in BI implementation, 3) provide better understanding on business context, interpretation results and training to the end-user. Even though both of them differ in their objectives and technologies used to develop them, together BI and KM can improve the organizational performance. BI and KM integration assists today's managers for improved/optimized decision making process by sharing data and information across the organization, getting the details from internal and external sources, forecasting the future trend and taking better decision . 5. The Proposed Framework In the proposed framework, BI tools such as data warehousing, data mining, reports and graph components are used. These components interact with each other to furnish users with comprehensive output. Input is generated by the operational layer in the data storage phase and that input is passed to data warehouse where data is processed according to the underlying input. With the help of data mining, useful information is mined out from raw collections of data. The data is passed to the KM component of the framework in the shape of reports and graphs to get the user feedback. It can be argued that there exists an interaction effect between KM activities/processes and BI tools and technologies. 5 106 This phase is an important phase as sorting, filtering, advanced search and query generation are all done within it. In this phase, information is extracted and processed according to the user requirements while passing through different phases. BI technologies such as OLAP, data mining, and other query reporting applications are integrated with KM processes such as knowledge discovery and KM technologies such as text mining in order to extract valuable information/knowledge from data warehouse. DM constitutes one step in the knowledge discovery process. It is in data mining step that the actual search for patterns of interest is performed. It is important at this stage to choose the appropriate data mining algorithm (neural networks, linear/logistic regression, association rules, etc.) for the data mining task. The extracted information/knowledge obtained by applying BI tools must be stored for future use and sharing within the organization. Knowledge repositories are widely recognized as key components of most KM systems used for storing such information/knowledge. They are collection of both internal and external knowledge and seek to capture both tacit and explicit knowledge. Explicit knowledge is generated with the help of OLAP, data mining and other reporting tools. Generated knowledge must be filtered, organized, and stored in a central knowledge repository to make them available efficiently and effectively. Tacit knowledge can be directly captured by KM system from the human experts. 5.3 Presentation Phase Inputs: Extracted, filtered, and organized knowledge. Outputs: The end result of this phase is provided as an output to the user in the form of summary reports and analytical graphs. Description: This phase represents the interface of the user with the system. In this phase some of KM and BI technologies are integrated with each other in order to provide more convenient information and knowledge service for decision making and management. Users can easily query and acquire knowledge in the knowledge base in order to share and exchange knowledge, and they can constantly enrich and update the knowledge base to achieve knowledge re-use and innovation. The used technologies in this phase include data visualization tools (such as: dashboards and balanced scorecards), reporting tools, document management, web content management, and groupware that support dissemination and sharing of information and knowledge in a collaborative environment. 6. Conclusions Organizations are moving towards BI applications for staying competitive, promoting businesses and retaining customers. On the other hand, organizations are also implementing KM systems to gain or retain the competitive edge. When BI and KM are combined together, they increase the efficiency and productivity of the concerned organization. In this paper, a framework is proposed that integrates KM and BI together. The integration between KM and BI can maximize user productivity, provide customers with the best service, improve the quality and speed of decision making and enhance competitive advantage. References  R.Shehzad and M.Khan, "Integrating Knowledge Management with Business Intelligence Processes for Enhanced Organizational Learning", International Journal of Software Engineering and Its Applications, Vol. 7, No. 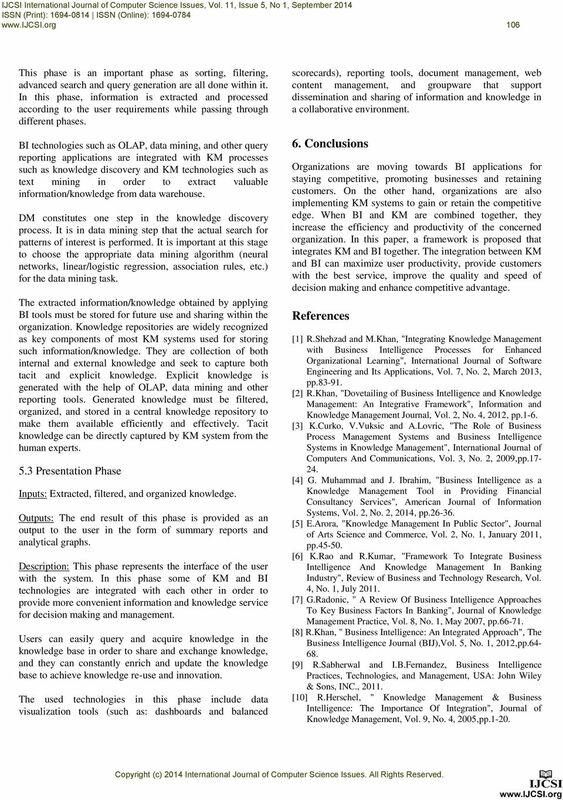 2, March 2013, pp  R.Khan, "Dovetailing of Business Intelligence and Knowledge Management: An Integrative Framework", Information and Knowledge Management Journal, Vol. 2, No. 4, 2012, pp.1-6. K.Curko, V.Vuksic and A.Lovric, "The Role of Business Process Management Systems and Business Intelligence Systems in Knowledge Management", International Journal of Computers And Communications, Vol. 3, No. 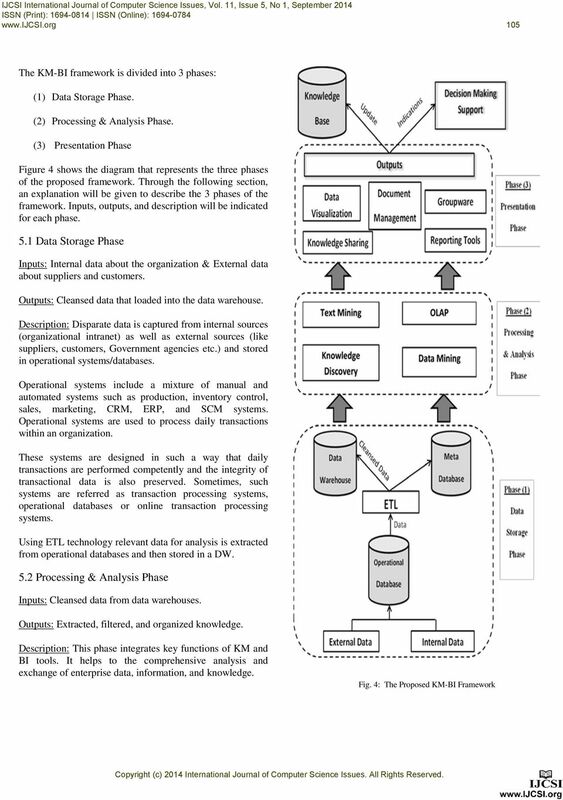 2, 2009,pp  G. Muhammad and J. Ibrahim, "Business Intelligence as a Knowledge Management Tool in Providing Financial Consultancy Services", American Journal of Information Systems, Vol. 2, No. 2, 2014, pp  E.Arora, "Knowledge Management In Public Sector", Journal of Arts Science and Commerce, Vol. 2, No. 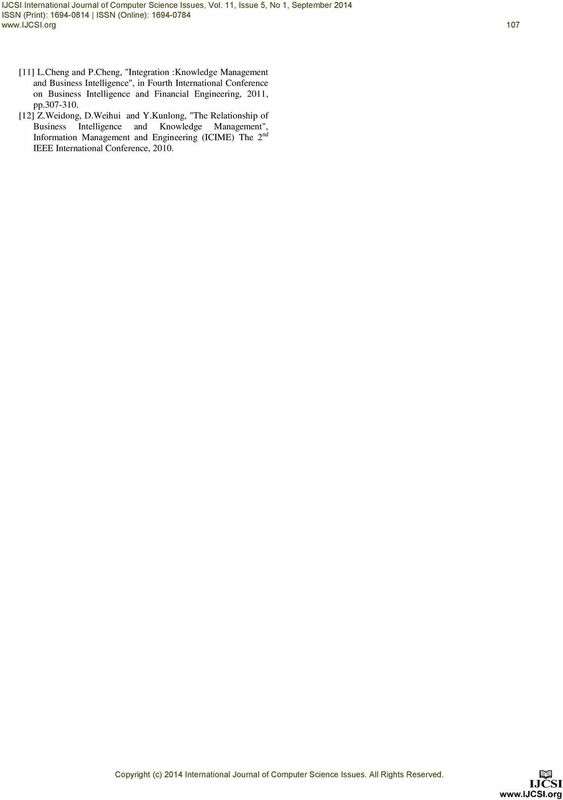 1, January 2011, pp  K.Rao and R.Kumar, "Framework To Integrate Business Intelligence And Knowledge Management In Banking Industry", Review of Business and Technology Research, Vol. 4, No. 1, July  G.Radonic, " A Review Of Business Intelligence Approaches To Key Business Factors In Banking", Journal of Knowledge Management Practice, Vol. 8, No. 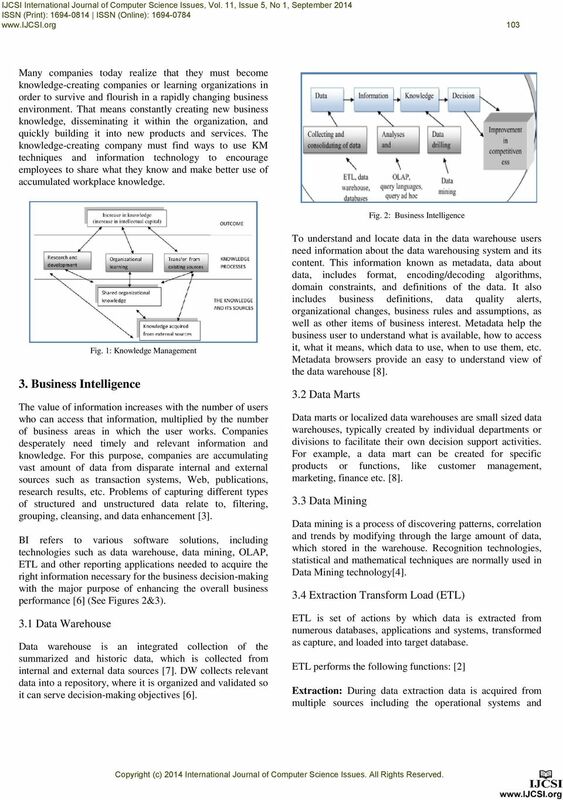 1, May 2007, pp  R.Khan, " Business Intelligence: An Integrated Approach", The Business Intelligence Journal (BIJ),Vol. 5, No. 1, 2012,pp  R.Sabherwal and I.B.Fernandez, Business Intelligence Practices, Technologies, and Management, USA: John Wiley & Sons, INC.,  R.Herschel, " Knowledge Management & Business Intelligence: The Importance Of Integration", Journal of Knowledge Management, Vol. 9, No. 4, 2005,pp.1-20. 6 107  L.Cheng and P.Cheng, "Integration :Knowledge Management and Business Intelligence", in Fourth International Conference on Business Intelligence and Financial Engineering, 2011, pp  Z.Weidong, D.Weihui and Y.Kunlong, "The Relationship of Business Intelligence and Knowledge Management", Information Management and Engineering (ICIME) The 2 nd IEEE International Conference, 2010. Outlines Business Intelligence Lecture 15 Why integrate BI into your smart client application? Integrating Mining into your application Integrating into your application What Is Business Intelligence?